Aaron Bholé completed his MBA in May 2017 from the Johnson School at Cornell University, where he also received his B.A. in Biological Sciences. He is a published author in oncology, radiology, and health policy. 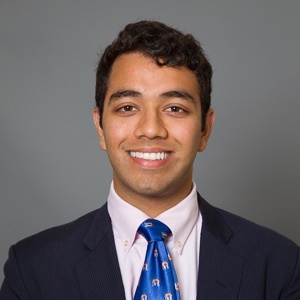 In summer 2017 he interned with the health policy team at the Manhattan Institute before starting medical school at Thomas Jefferson University. . I really enjoy travel, food, & the outdoors! To visit Cuba as a “journalist,” I started a food blog called “Urban Am’bro’sia” (shameless plug). I’m probably the only hit the website gets, haha. The Adam Smith Society exposed me to ideas and individuals from across disciplines and geographies. Discussions with fellow participants at the Smith Soc Trek “Rebooting Healthcare” inspired my recent article “Hemorrhaging Healthcare: ACA Woes & AHCA Pitfalls”. I want to transform the healthcare industry into a modern market by empowering healthcare consumers to make cost/benefit decisions. My dream would be to create a tool that allows consumers to easily evaluate prices and outcomes between different providers and procedures. A follow up. If you had the power to give doctors one medical technology they don’t have, what would it be and why? I’d want “next generation” sequencing to be readily available and affordable for every patient. The information contained in the human genome is the scientific world’s form of enlightenment. From precision medicine in cancer to the underpinnings of mental illnesses, genetics is key. That’s why I’m also a big supporter of direct to consumer genetic testing, and I believe that every individual has a right to access their own genetic information. NASA is sending you to lead the colonization of a new planet. But you have to pack light. You can only take 3 books with you – one book on political and economic philosophy to help start the government, one business book to guide entrepreneurs, and one work of fiction to keep everyone entertained. What do you take and why? First, I’d take Adam Smith’s The Theory of Moral Sentiments since it outlines the relationship between individual interests and society. While not start-up focused, I’d bring Daniel Kahneman’s Thinking, Fast and Slow because it probes humanity’s rational and psychological natures. My fiction choice is The Hobbit but only because I can’t pack the trilogy. It’s a bildungsroman that demonstrates even the tiniest people can overcome trolls, goblins, and dragons.